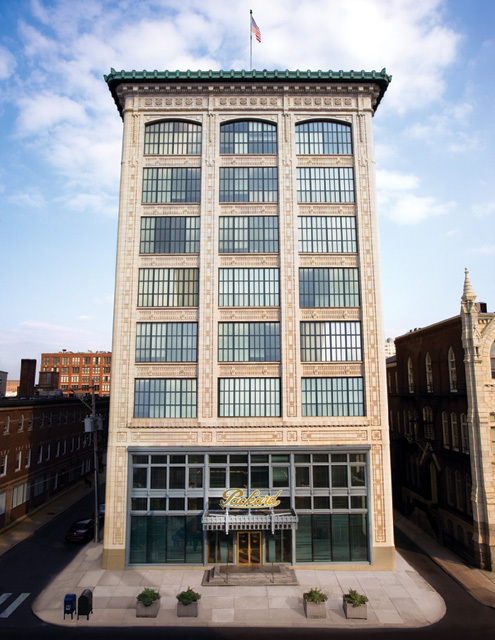 The Packard Motor Car Building offers Center City apartments for rent near Hahnemann Hospital, in a historic limestone and terracotta-trimmed building featuring hand-carved cornices and oversized windows. Standing as an iconic landmark of Philadelphia’s historic automobile industry, these apartments, designed by Detroit architect Alfred Kahn in 1910, originally served as a showroom and assembly plant for Packard Motors and the newspaper office for the Philadelphia Record. The Packard Motor Car Building was then repurposed into the sleek Center City apartments for rent they are today. Exquisite chandeliers and rich mahogany woodwork dress the grand two-story lobby of our Center City apartments, which has been recently restored to preserve its original architectural integrity. These apartment homes offer modern kitchens, a brand new social center, on-site parking, and fitness center, and sweeping views of Center City in a prime location for work, transportation, and relaxation. These apartment homes offer modern kitchens, a brand new social center, on-site parking, and fitness center, and sweeping views of Center City. Located in a prime location close to public transportation and the Philadelphia International Airport, getting to work or a weekend away is simple. Learn more about you’ll gain when you live in Center City, Philadelphia!